I have to preface this post with several disclaimers. First of all, the truth is that I have no interest in sports. How I ended up married to a major sports fan who would pass that gene on to both my daughter and my son, is beyond me. I am definitely an outsider in my semi-fanatical sports fan family. Those of you who care about football, will understand that NFL football and St. Louis have a love-hate relationship right now. Emphasis on the hate. You know the Los Angeles Rams that are in the Super Bowl this year? From 1995 to 20016 they were the St. Louis Rams. My husband owned season tickets. My son literally grew up (ages 2- 23) going to games. His childhood bedroom at our house is still painted Rams colors. My daughter, also went to games and was a member of the Lady Rams Club, attending their charitable and entertainment events. So, when Stan Kroenke, the Rams owner, made the business decision to move the Rams back to Los Angeles, he created a lot of anger, bitterness, and financial disaster in St. Louis. Not to mention, fanatical fan heartbreak. Though my family has mixed feelings about football right now, I made Shortbread Thumbprint Cookies with chocolate footballs for those of you who are excited about the game this Sunday. 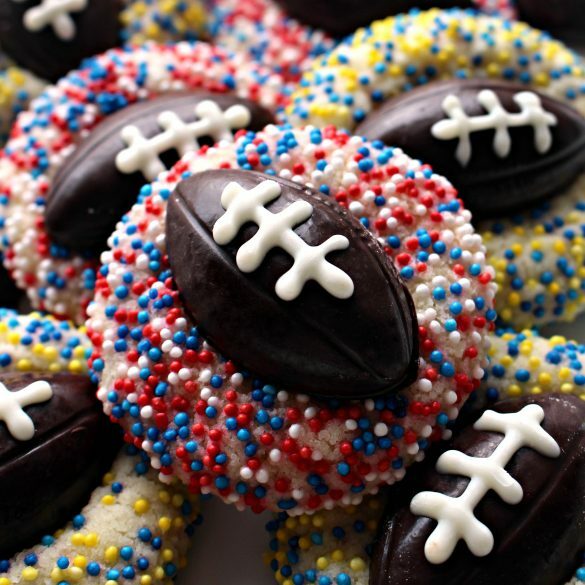 Choose sprinkles in the colors of your team, and sweeten your Super Bowl viewing! There are many different kinds of cookies used to make thumbprint cookies. For care package baking, I chose a shortbread type cookie for its sturdiness and longer shelf life. Technically, Shortbread Thumbprint Cookies may fall into the butter cookie category. Though the bottom line is that these cookies are delicious, the difference between shortbread, butter, and sugar cookies can be confusing. ARE BUTTER COOKIES THE SAME AS SHORTBREAD? The differences in cookies are due to the ratios of the ingredients by weight or by volume. Shortbread cookies have the highest ratio of butter to flour. Butter cookies have more sugar than shortbread which can make them less crumbly. WHAT IS THE DIFFERENCE BETWEEN A SUGAR COOKIE AND A SHORTBREAD COOKIE? Traditional shortbread has only three ingredients (sugar, butter, and flour) in a 1:2:3 ratio by weight. Sometimes extracts are added for flavoring. Sugar cookies have more ingredients (butter, flour, eggs, leavening, and flavoring) which results in a sweeter cookie with a sturdy texture. The shelf life of thumbprint cookies depends on both the cookie type and the filling. A shortbread type cookie can stay fresh at room temperature in an airtight container for several weeks. Sugar cookies change texture and get crunchier over time. Cookies filled with jam have the shortest shelf life due to the moisture from the jam. A chocolate candy center doesn’t shorten freshness of a cookie. 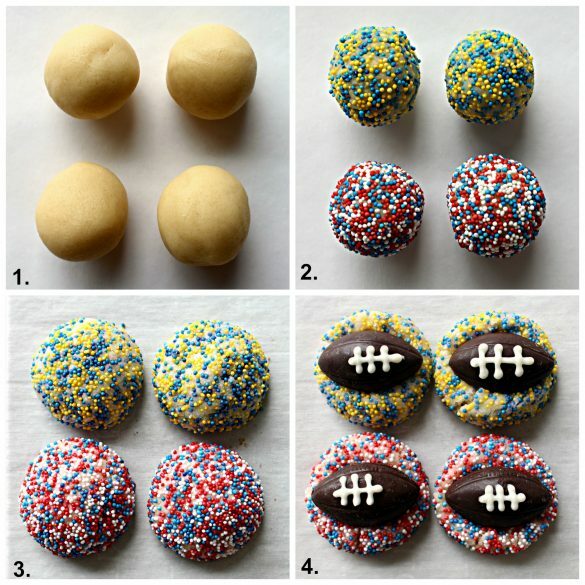 Shortbread Thumbprint Cookies with chocolate footballs stay fresh for up to two weeks. Yes, these thumbprint cookies with chocolate candy centers can be frozen for up to one month. To customize the Shortbread Thumbprint Cookies for the Super Bowl, I made chocolate footballs to press into the “thumbprint” on each cookie. Making your own chocolate shapes is fun, quick, and easy with melting chocolate (I use ethically source and fairly traded Chocoley.com Bada Boom Bada Bing dark candy and molding formula) and a plastic mold. For 36 footballs in the mold I used, you will need 1 1/2 cups of dark melting chocolate and 1/2 cup of white melting chocolate. **SPECIAL TIP** No football mold or pressed for time? Remove the foil from little chocolate Easter eggs and skip straight to step number 3!! Aldi’s sells UTZ certified (fairly traded) chocolate Easter Eggs. Melt dark/milk chocolate in a double boiler or in the microwave at 50% power. Transfer the melted chocolate into a disposable piping bag. I prefer using the piping bag over a regular plastic bag, because the plastic is a little thicker and easier to handle. Pipe the chocolate into the football mold cavities. Carefully, tap the mold on the counter to release any trapped air bubbles. Refrigerate the filled mold for 5-10 minutes until the chocolate has firmed. Remove from the fridge. Turn over the mold and tap on the counter to release the chocolate footballs. Melt white chocolate in a double boiler or in the microwave at 50% power. Transfer the melted chocolate into a disposable piping bag with a #2 small round tip. If using a plastic bag or if no piping tip is available, snip a tiny corner off the bag to pipe through instead. Pipe laces onto the chocolate footballs. Refrigerate the footballs for about 5 minutes until the white chocolate is firm. Where do you find colored nonpareil sprinkles to match every holiday and theme? Make your own! You won’t believe how easy it is to make custom colored sprinkles. This method works for jimmies and sugars as well. Put the desired amount of white nonpareils in a ziplock sandwich bag. Add a few drops of food coloring gel. 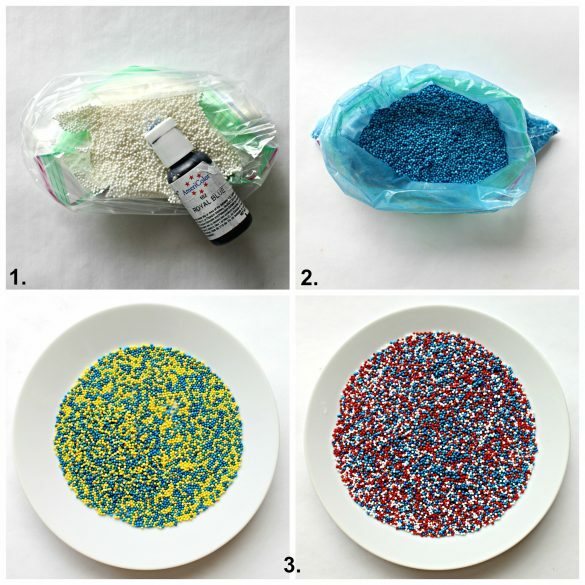 Mush and squeeze the bag to distribute the gel and color the sprinkles. Add more coloring as needed to achieve the color intensity you want. Leave the bag open so that the sprinkles can dry out for a few hours or overnight. Before using, mush and massage the bag again to break up any clumping. Create your own custom sprinkle blends, like this Rams blue and gold and Patriots red, white, and blue. With just a handful of ingredients, these cookies couldn’t get much easier! Cream together the butter, sugar, and vanilla.Mix in the flour to form the dough.Use a small cookie scoop to portion the dough into 1 tablespoon amounts. Roll into balls. Coat the dough balls completely in sprinkles. Chill for 10 minutes. Bake the cookies at 350° F for 10-12 minutes. While the cookies are in the oven freeze the chocolate footballs. When the cookies are done, allow them to cool for about 2 minutes. Then press a chocolate onto each cookie.Refrigerate the cookies for about 20 minutes until the cookie is no longer warm and the chocolate is firm. This recipe is adapted from my friend Chris at The Café Sucre Farine. Be sure to take a look! She has used this yummy recipe for years to create a wide variety of beautiful holiday cookies. While adapting the recipe to create Shortbread Thumbprint Cookies I discovered a few tricks for success and ideas for customizing. Chilling the cookies for just 10 minutes before baking keeps the cookies from spreading. Rounded cookies are ideal for thumbprints. Freezing the chocolate while the cookies bake minimizes melting when the chocolate comes in contact with the warm cookie. Refrigerating the cookies will speed up the firming of the added chocolate candy. If left at room temperature, the chocolate will take a long time to solidify on the slowly cooling cookie. Just in case you missed it above, unwrap little foil Easter Eggs for ready to decorate chocolate footballs! Though Kisses are the most commonly used candy in these cookies, they are not ethically sourced. You might consider using Fair Trade chocolate bars (cut into small pieces), peanut butter cups (Aldi’s carries a UTZ brand), or melted chocolate piped into the center. 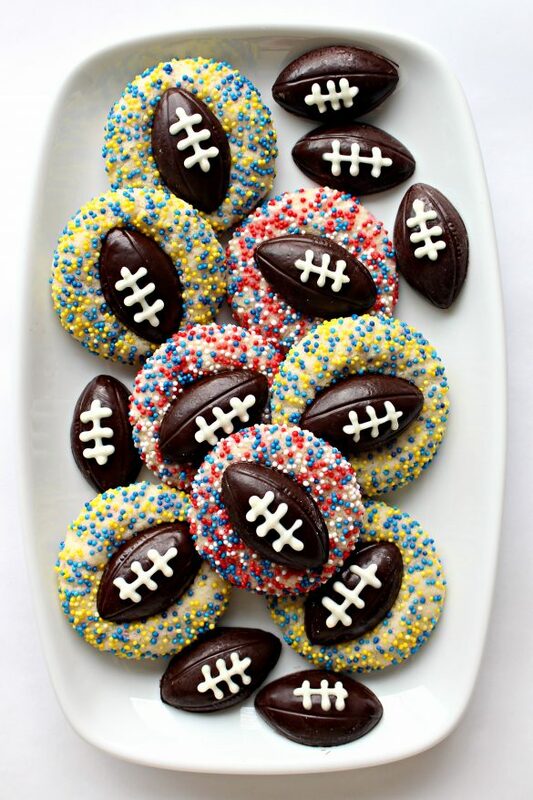 Shortbread Thumbprint Cookies with Chocolate Footballs are a special addition to care packages for football fans or to serve to the football fanatics at your house as they cheer on their team during the big game. 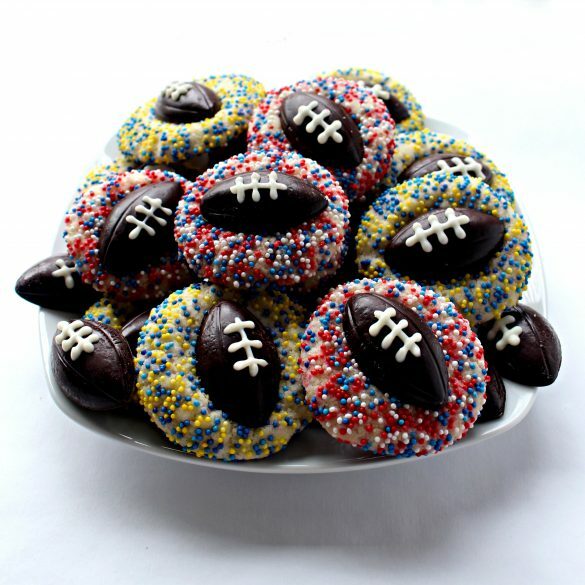 Delicious football themed snacking at its best! Preheat oven to 350° F. Line a baking sheet with parchment paper. Pour the nonpareil sprinkles into a shallow bowl. In the bowl of an electric mixer, cream together the butter, sugar, and vanilla. Use a small (1 tablespoon) scoop to portion the dough. Roll each portion into a ball and roll the dough ball in the nonpareil sprinkles to cover completely. Place the sprinkle coated dough balls on the prepared baking sheet about two inches apart. Refrigerate the baking sheet of dough balls for about 10 minutes. Remove from the refrigerator and bake for 10-12 minutes. While the cookies are baking, place the chocolate footballs in the freezer. Chilling the chocolate will keep it from quickly melting when placed on the hot cookies. Remove the cookies from the oven and allow to cool for about 2 minutes. The top of the cookies will still be light and the bottom should be just turning golden. 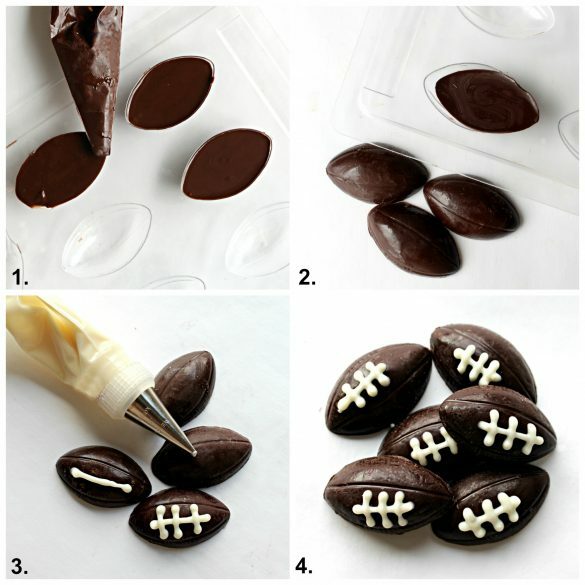 Take the chocolate footballs out of the freezer and gently press one onto each cookie. Transfer the cookies onto a cutting board or platter and refrigerate for 20-30 minutes to keep the chocolate from melting while the cookie cools. When the cookies are cool and the chocolate is firm, store the cookies at room temperature in an airtight container for up to two weeks. Layer cookies in an airtight container with wax paper between layers. Use crinkled tissue paper or wax paper between the top layer of cookies and the lid to ensure no movement while shipping. I find football okay, but like it better when my favorite teams win. You make cute little footballs out of chocolate. Your family must really love that! Have a good weekend! Thanks, Linda! I am not a sports fan but I AM a cookie fan. 🙂 Enjoy your weekend as well! Wendy, these are so cute! I love the little chocolate footballs you’ve made. Your Shortbread Thumbprint Cookies are charmingly adaptable, but I think this incarnation is just so much fun! It’s so hard when our favourite teams move etc. I hope you all enjoy the Super Bowl despite the sadness that your team moved. I totally get it, because I am still a real Toronto Maple Leafs despite not having lived in Canada for 30 years! If they changed city I’d be so cross. Thank you so much for sharing, and for supporting The Hearth and Soul Link Party. Pinning to 2 boards and sharing. Have a great weekend! These may be the cutest cookies I have ever seen! I make care packages for my kids and care package printables for my readers. I am going to add a link to this recipe to one of my Super Bowl Care Package posts. I have already sent my packages for this year, but will definitely make these next year!! 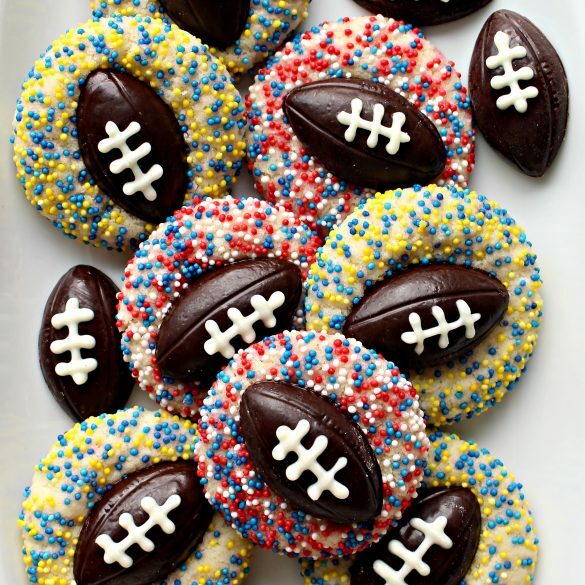 Your cookies are so cute and perfect for this weekend of football. Found you at Friday Feature. I will tell you that I have a nephew who absolutely was devastated when the Rams left LA since he lived there and was a huge fan. But he stuck with them through the St. Louis days, even though he was unable to attend any games during that time. He was excited to have them move back to LA. He is so excited for this weekend, and says that no matter where they play he is a fan! Yes, he is definitely one of those die hard fans. I hope that they do well, just for him. He has waited a long time. Enjoy your cookies! 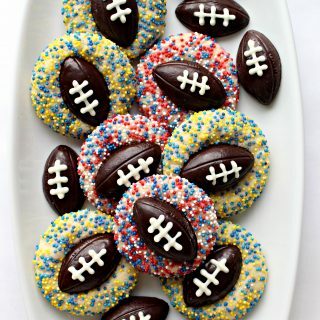 I’m a football fan and a cookie fan so I’m loving these. I like how you use sprinkles for the team colors! Thanks for sharing your yummy recipe with us at Merry Monday. Pinned. See ya next week. These little footballs are very special, and your tutorial makes it look real easy. Hope you are having a great week and thanks so much for sharing your awesome post with us at Full Plate Thursday! Thanks, Miz Helen. Sometimes, just looking at a photo can make directions so much clearer! Have a great week! What fun cookies!! Thanks for sharing at the What’s for Dinner party. Hope the rest of your week is amazing! Thanks, Helen! Have a great rest of your week!